For this review I have roped in my usual co-op partner-in-slaughter Kenti. Mainly because it means I only have to write half as many words, but also because he played through the game with me after I called in an old, old debt. Kenti: I owe Hentzau. I made him play Hunted. This is the sort of crime that is only excusable if… well, it’s not excusable. In any case, the brief moment of madness that made Hentzau play it with me means that I readily agreed to help run him through Gauntlet. Hentzau: Or THE Gauntlet, as the wordy narrator keeps calling it. Kenti: Now, I remember Magicka – it was extremely hectic, confused, and had quite a few gems of an idea that I felt didn’t quite come together into an actually sustainable co-op experience. Gauntlet works a lot better as the ideas are better developed, the combat a little more controlled, and the fun a lot more accessible. 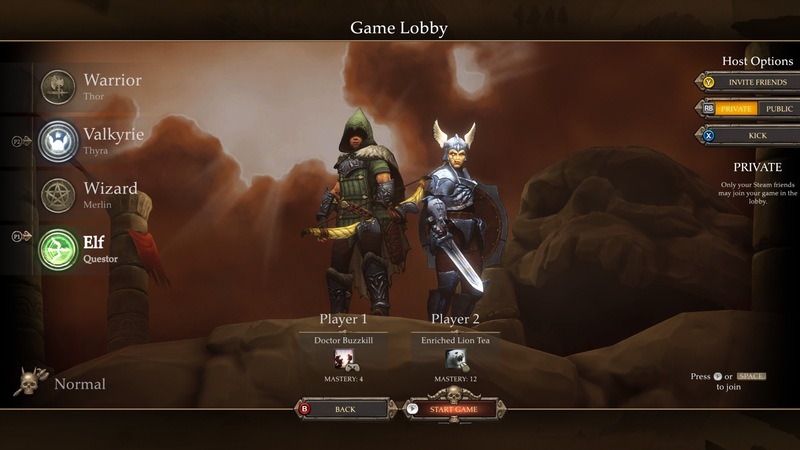 Hentzau: See, I was actually a little bit surprised to see that they’d taken Gauntlet as an opportunity to continue and expand on the ideas they first explored in Magicka. I thought with a new IP they’d be trying a new approach, but the two games share an unusual amount of the same DNA. Kenti: Well. There’s a wizard. Hentzau: Yes, there’s a wizard, who you never played. Kenti: Briefly, in the intro tutorial, which lets you try out the characters. Which is pretty great because each of the four – Warrior, Valkyrie, Elf and Wizard – use different controls, different attacks and have different special abilities. The wizard is the one that uses the Magicka-like art of combining different elements to create different spells he can use. Hentzau: He’s got nine in all, and casts them by pushing two buttons to combine two of ice, fire or electricness and then the right thumbstick to fling it in the appropriate direction. He has an ice ray, an electric shield thingy, he can turn himself into a fireball and zip across the map… the Wizard on his own has nearly enough design in him to sustain an entire game. 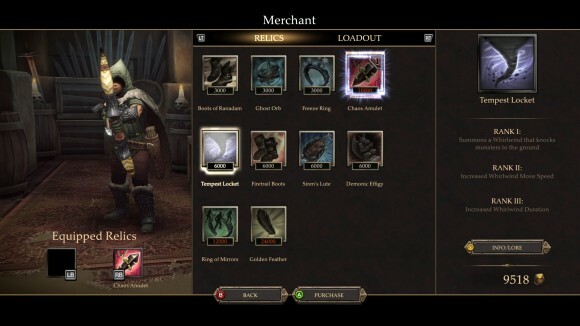 And I guess he kind of did – in Magicka. 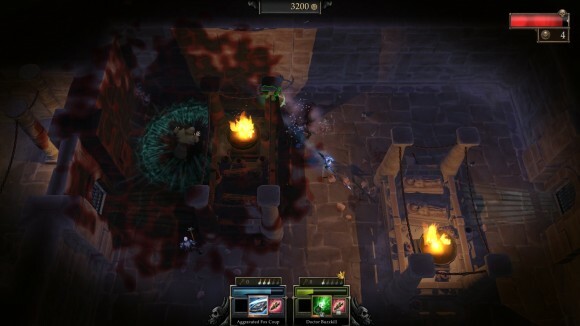 Kenti: I was quickly convinced that, after struggling to coordination my wizards in Magicka, I wanted none of it thank you. It was the Valkyrie for me with her spear that cleaves through columns of enemies, a shield she can block with and will also occasionally throw it like Xena’s chakram. That bit is awesome. Valkyries are the best. Hentzau: Valkyries are overpowered, more like. Kenti: I will freely admit this. Hentzau: Anyway, the Valkyrie has a completely different skillset to the Wizard, controlled using completely different buttons. She’s a heavy warrior built for smashing enemies at close range, and she in turn couldn’t be more different to the Elf, whose ability to run around with the left thumbstick while spraying arrows in all directions with the right turns Gauntlet into something of a twin-stick shooter. Hentzau: It would have been nice if the character skills could have been developed a little further during the course of the game. 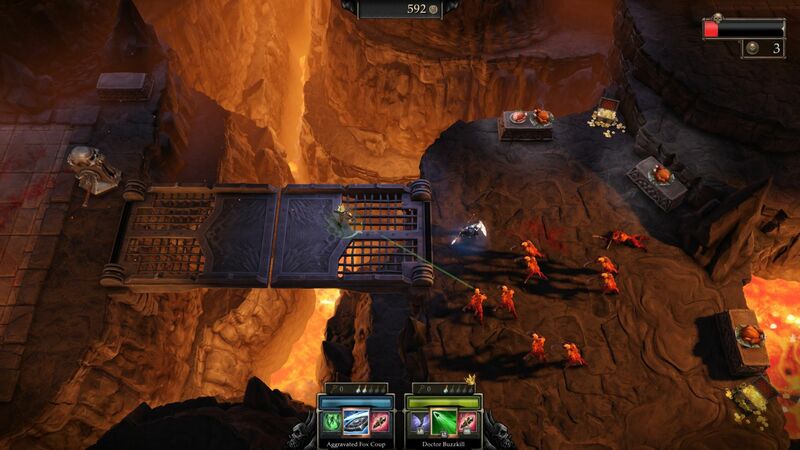 For example, the Elf can drop a bomb with the left trigger that explodes after a short period, usually blasting the horde of enemies chasing him into chunky kibbles. About five minutes after you start playing him you unlock the ability to instead strap this bomb to an arrow — it being lodged inside some unlucky monster’s sternum means it has a smaller blast radius, but the increased range on it is worth the tradeoff. It’s interesting expansion of abilities like that that I thought was missing from the game at large; this one extra ability is the only thing the Elf learns throughout the entire game. Otherwise the skillset you start the game with will, by and large, be the same as the skillset you finish it with. Kenti: Likewise, the Valkyrie’s shield develops the ability to deflect projectiles directly back at their casters. That’s cool, but it goes no further. It may be an unfair comparison, but Diablo 3 regularly treats you to new variations on your skills, giving you cool new things to do. It felt like Gauntlet might do a lot more of this, but the other ‘Masteries’ that you can unlock are little trickles of bonuses (+ 5% to gold drop on cave levels – hardly inspiring or exciting stuff) as if the devs could only come up with just a handful of fun upgrade ideas. Kenti: But look at me doing it. See how I castigate it like a pro. Actually I felt happy enough with what I was given for the time we played. Hentzau: Ah, but this is Gauntlet’s problem, the meat of which we’ll get to in a bit, but which I think starts with the abilities: because there’s no real development of your characters over time, Gauntlet’s replayability is drastically reduced. Kenti: Let’s talk about the actual structure of the dungeon-delving. Hentzau: And we mean it quite literally when we call it a structure. There are three “chapters” in the game. Each chapter consists of three sets of three levels, followed by a bossfight. 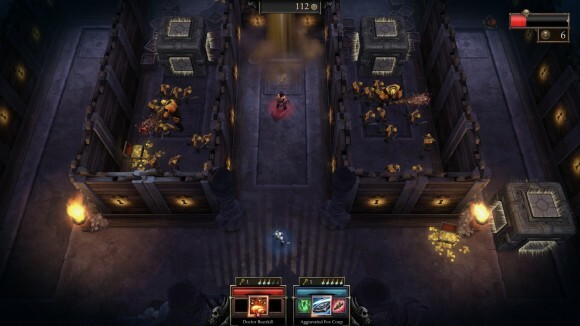 The level sets each follow the exact same pattern – there’ll be a traditional level where you hit monsters and solve the occasional puzzle, followed by a gimmick level which changes per chapter – one has you crawl through levels in total darkness, while another has Death sprinting after you almost the entire time you’re in there — followed by an arena fight where you just hit monsters for five minutes. Because the levels were arranged in such a regimented and predictable manner I thought Gauntlet ended up feeling dreadfully repetitive, even though individual levels sometimes departed from this norm. Kenti: I did like how it was arranged. You knew what was coming, and the rhythm of it was quite enjoyable. There was a sense of progression and achievement as you tackled each one in turn. The pattern of the game follows through even here though – as it gives you great ideas with one gloved hand, so it punches you senseless with the other gauntleted one. The levels all end up a little samey in their categories and puzzles are awfully thin on the ground. Indeed, there were all of three or four levels where we had to wrack our brains even for a second as to where to go and what to do. Hentzau: I counted two, both of which were towards the end of the game. For the most part Gauntlet’s level design is painfully linear, for all the lengths that it goes to to try and disguise it with the odd bit of backtracking. You run down a corridor into a room. The doors slam shut. Monsters and summoning stones appear. You shoot the monsters and the summoning stones. The doors open again. You run down a corridor into another room. The doors slam shut. Repeat ad infinitum. Or until the game ends. Kenti: There is a little variety – there are barrels. Big pushable stones. Pulleys! Hentzau: There’s one level where you have to fill a lava pit by guiding a stream of lava down a set of four channels, each of which loops out through one corner of the map. Then there was the one where you had to guide pushable stones down a series of drops to get them to make a bridge to the level exit. These represented the extreme limits of Gauntlet’s imagination, and while they made a welcome change from just hitting monsters I couldn’t shake the feeling that the entire game should have been like this, not just two levels out of twenty-seven. Kenti: It also runs out of steam on bosses – the first requires you to figure out a way to damage it, and then follow through while dodging enemies. The second one has a few special moves, and a time when you can’t damage it, but otherwise you just wait and then fill it full of flying shields. The last one, again, has some different attacks, but really you’re just waiting until you are permitted to deal a little damage in-between dodging mountains of summoned beasties. Were their good boss ideas exhausted by that first one? Hentzau: I just get the distinct impression most of Gauntlet’s good ideas went into the four different characters, with precious little left over for the rest of the game. Kenti: I did enjoy myself though. Hentzau: Oh, it’s inoffensive enough. The act of hitting the monsters is satisfying, as it should be, and when played in co-op there’s also a subtle sense of competition with other players as you vie for gold and food. The crown is also quite fun – on each level one of the monsters will drop a crown, and the player who finishes the level with it perched atop their noggin gets a gold bonus. The catch is that every time you get hit the crown flies off and is fair game for anyone to pick up. Kenti: Also, you shot my food sometimes. Hentzau: Not on purpose! But when you’re firing that many arrows, some of them are going to lodge inside the many delicious cooked turkeys inexplicably scattered throughout Gauntlet. It’s a simple fact of life. Kenti: I don’t believe you. That’s why I threw my shield about so much. In retaliation (it too can destroy the live-giving food, though I have no control over it). Hentzau: I think in some of the publicity gumpf the phrase “competitive co-op” is mentioned, and Gauntlet certainly achieves this. It’s just a shame that gold means so little, otherwise screwing your companions out of it might actually matter. Kenti: Leaderboards! It had those. What was all that about? Hentzau: I’m not 100% convinced those were actually working, since they’d consistently show somebody with a lower score than us as the world champion. Kenti: I suppose it’s also worth mentioning that we didn’t really experience any problems, either with the game’s performance in general, or with connectivity. You hear some things, in the dark deep recesses of the internet… but I don’t think there is anything fundamentally broken or wrong with the game. Hentzau: Which given Magicka’s disastrous launch was one of my primary concerns with the game, but Gauntlet’s netcode was solid as a rock. 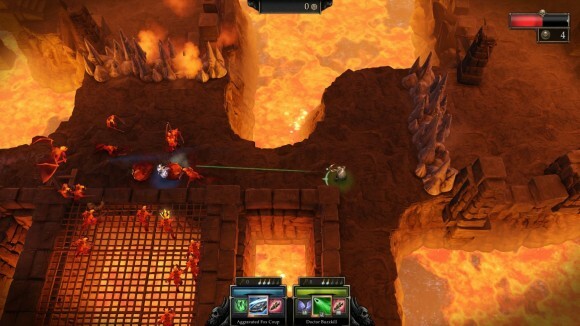 Of course Steamworks is now available as a fantastic integrated solution, and Gauntlet makes full use of it. Kenti: In the end, I felt I got my money’s worth for the five hours we spent in the game. That’s really where all of the problems converge though: it provides just a short, sharp dose of quality entertainment. Hentzau: Substitute “acceptable” for “quality” and you’d have my opinion on the game. Kenti: I call this agreement. Well done us. Hentzau: I certainly have no urge to replay Gauntlet. Ever. Well, maybe if a couple of other friends pick it up it might be fun to dabble in the full four-player experience, but it has none of the hooks that drove me to invest upwards of 200 hours in Diablo 3 – I don’t want to tackle harder difficulty levels or hoard money to upgrade the paltry collection of relics that function as the game’s sole gold sink. It’s just super-light and super-disposable, and for some people that’ll be enough. For me, I don’t think it is. Kenti: Yeah, I don’t see myself coming back to it unless there is new content, or someone tells me it’s really that different with four players. I suppose while I wouldn’t invest more time in Gauntlet as it is, I would welcome some DLC levels. Especially if they sat down and thought really really hard about some new ideas. 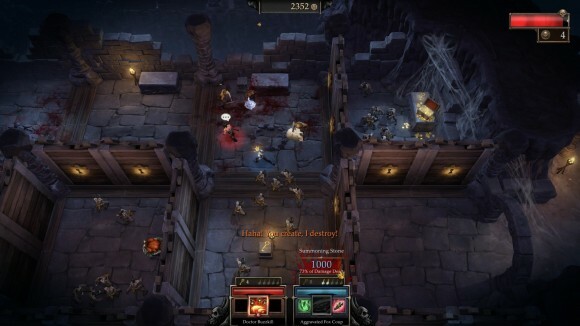 Hentzau: I guess Gauntlet’s problem, ultimately, is that it’s screwed no matter which game space it tries to exist in. Diablo 3 has the hitting monsters side of things well sewn up, and any credentials it might try to claim as a fun arcadey couch co-op experience are, I’m fairly sure, soon to be nuked from orbit by the sequel to Guardian of Light. Kenti: Oooh. That. Are we going to both play it without some sword of damocles hanging over our heads? I mean, my debt is paid. I am free…. 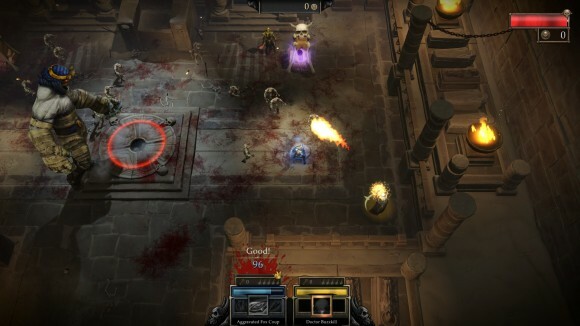 Hentzau: If you don’t buy Temple of Osiris I will literally something something bloodcurdling threat. Kenti: Ah, good. Everything feels comfortably deadly once again. Yeah, Diablo 3 really does have a good feel to it now. Then again, that’s after the base game (RRP ridiculous amounts of Activision blood money) which didn’t quite get there and an expansion (RRP unfathomable riches for an expansion) that eventually brought things into line. So I give Gauntlet a pass on that front – they’ve done a tight, small-scale job pretty well. I will still come back to Diablo 3 instead though. I’ve only played the console iteration, which was pretty good from the start and only got better with the expansion. If Gauntlet wants to go to consoles I think it’s going to suffer in comparison. Gauntlet would work as an XBLA title – if that’s even still a thing, my view of consoles is still firmly rooted in 2007 and I keep having to remind myself that last gen is 9-10 years old now. It’s precisely the sort of light fare that seems to thrive on there. I don’t know much about how XBL works, as I’ve always favored Sony. The PSN definitely pushes indie titles though, and I could see them giving this a good window for success, especially as a Playstation Plus giveaway. I just don’t see why anyone who wasn’t strapped for cash wouldn’t just opt for Diablo III, though. As an aside, I’m surprised Diablo 3 has done so well on console since the ARPG has always had difficulty making the jump from PC – I think there were a handful of them for the original Playstation, and then pretty much nothing until D3. Blizzard’s also not a studio with a great deal of experience in the console space (if you don’t count the ill-fated Starcraft Ghost). I thought it’d be a modest success at best. Still, good on Blizzard for making it work. It also makes it more likely we’ll see a second expansion for it, which I’m all in favour of. When I first heard about the control scheme for Diablo III I thought, “That sounds more like a console setup than a pc one.” And my limited experience with the Diablo III trial confirmed that it felt very weird to play the game that way with a keyboard. But on consoles it’s actually quite elegant and a real joy to play. It does make some skills more popular choices just because they *feel* better to use, regardless of other traits (the Demon Hunter’s Rapid Fire comes to mind) but other than that it’s a real triumph. Off-topic, and I’m sure that your next post lined up rimes with Basteland Bloo, but do you have any short, pithy thoughts on Endless Legend that you might share with the class? I would also like to hear some thoughts on it. I’m finally making some progress with it myself, and it’s a weird beast with some really cool ideas. I have played it for an hour, which isn’t anywhere near enough time to form a good opinion, but it seems rather… dull, at least so far. I’m sure it has some depth to it — for all of its flaws Endless Space was a pretty competent game when all was said and done — but it’s dull enough that it’s going to the back of the queue of games to play, so I wouldn’t hold your breath waiting for a review this month. Fair enough. It took me a bit to get into it; the tutorial isn’t adequate for teaching the intricacies of the game. But once it clicked I thought it was better than Endless Space. I’m still not 100% clear on some systems, but I spent a decent chunk of today nattering at my boyfriend about it, which is as good a recommendation as I can offer. @Josh: Try asking Jim for an opinion, he says he’s finally getting into it after sixteen hours.